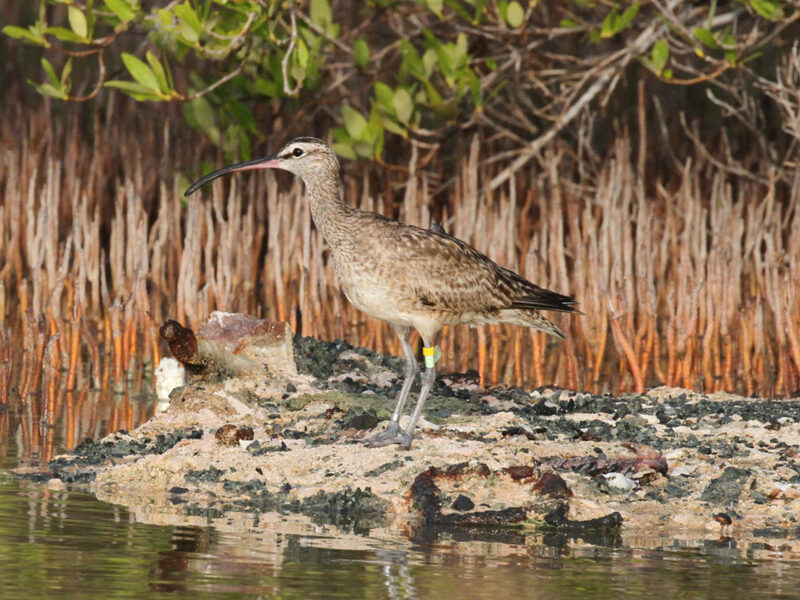 Scientists at the Center for Conservation Biology (CCB) and the Canadian Wildlife Service have tracked 3 whimbrels on a 15,000 mile (24,000 kilometer) loop migration from breeding grounds along the Mackenzie River in western Canada to wintering grounds in Brazil and back again using different routes. The route was broken up into 4 major flights including 1) Mackenzie to the east coast of Canada, 2) Canadian coast to Brazil, 3) Brazil to the Gulf of Mexico, and 4) Gulf of Mexico to Mackenzie. 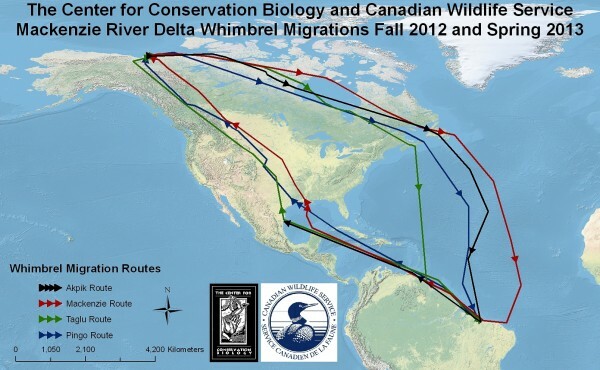 Three of these segments were previously unknown migration routes. Tracking map – Map of Mackenzie River whimbrel movements July of 2012 through June of 2013. 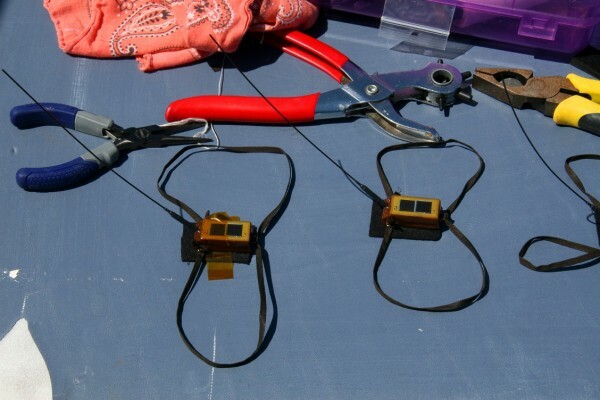 Birds have been tracked using solar-powered satellite transmitters. Map by CCB. 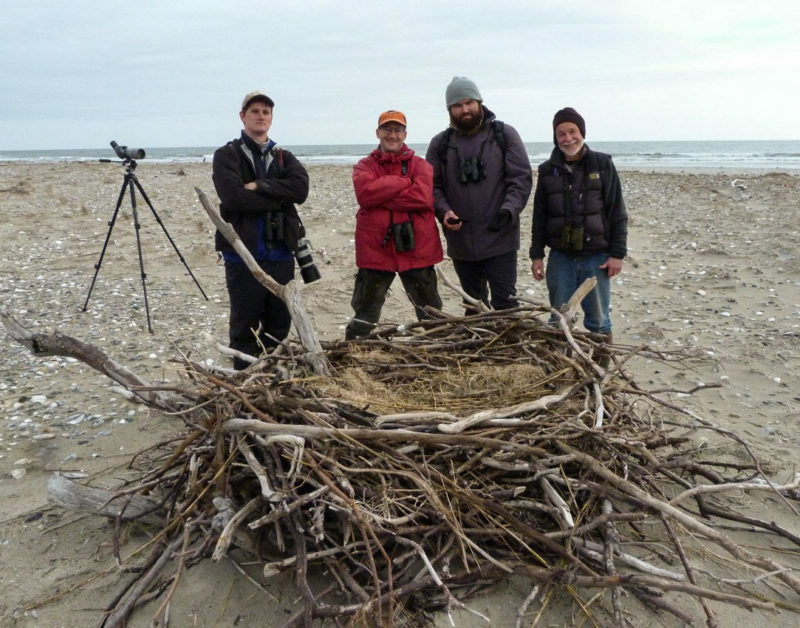 The three birds named Mackenzie, Taglu, and Pingo were originally marked by CCB and Canadian Wildlife Service staff on the breeding grounds along the Mackenzie River Delta in far western Canada (Mackenzie was fitted with a transmitter recovered from Machi, a bird that was shot on Guadeloupe in September of 2011). 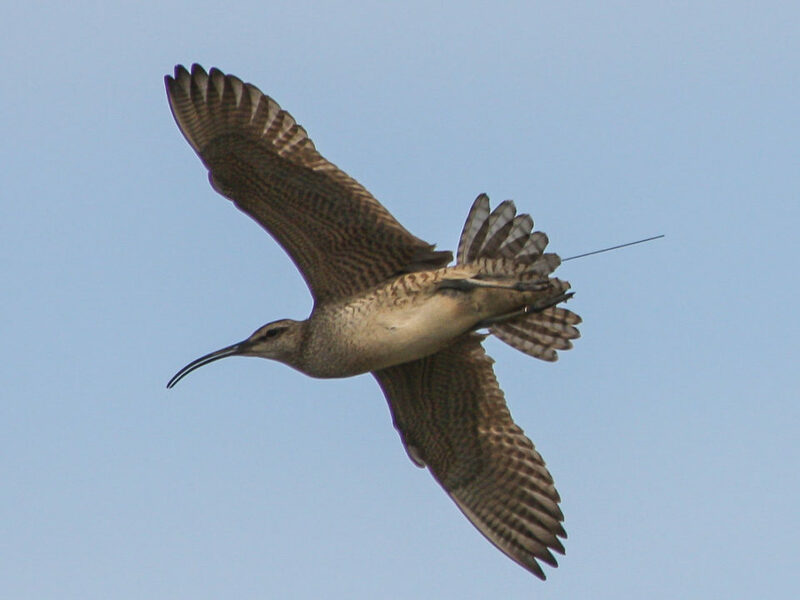 A forth bird (Akpik) was tracked through three migration legs but its signal was lost in May on the coast of Mexico. The tracking data reveal the rigors of migration and identify staging areas important for the conservation of the species. In mid-July the birds took a bold migration route flying 2,800 miles (4,500 kilometers) to the east coast of Canada to stage for 2 weeks before embarking on a marathon 4,300-mile (6,900-kilometer) flight out over the open ocean to the northern coast of Brazil. The birds spent more than 7 months in the extensive tidal system of the Gulf of Maranhao before initiating their spring migration. 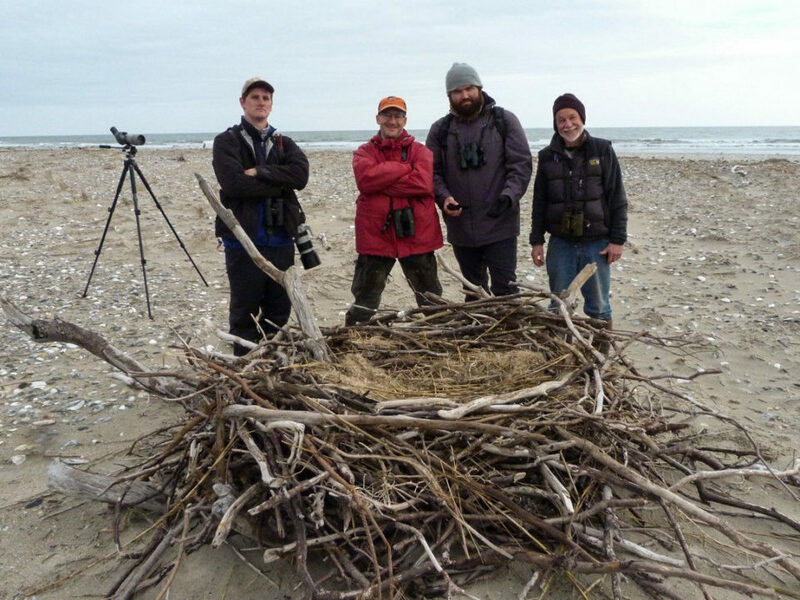 The birds left their wintering grounds on a nonstop, 4,000-mile (6,400 kilometer) flight to the Gulf of Mexico where they staged for 3 weeks before leaving for their final 3,000-mile (4,800-kilometer) journey to the breeding grounds. Along the way Pingo stopped along the Platte River, a well-known staging area for the extinct Eskimo curlew. 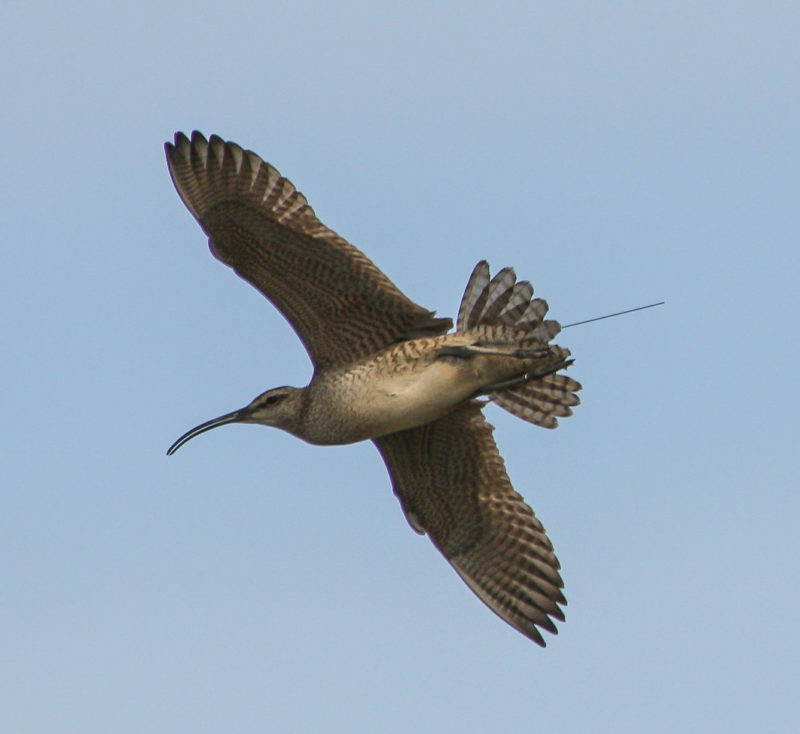 The Mackenzie whimbrel have now linked sites in far-flung, unexpected regions in their orb of conservation. Important in their own right, each of these sites must be considered collectively for conservation efforts to be effective. Mackenzie staged in the heart of the area impacted by the Deep Horizon Oil Spill. 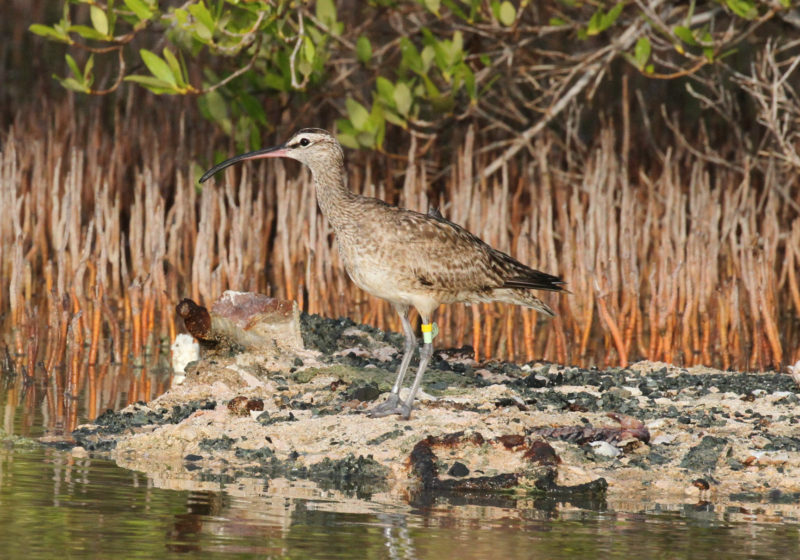 The spill began on 20 April, during the time of whimbrel staging in 2010. Such events highlight the fragility of conservation networks and the importance of locations and cultures working together toward common goals. Through these birds we now know that an oil spill in the Gulf of Mexico may impact a breeding population on the Mackenzie River, or a staging area in Nova Scotia, or a wintering area around the mouth of the Amazon. Understanding these linkages is a critical step in protecting these networks and the species that depend on them. 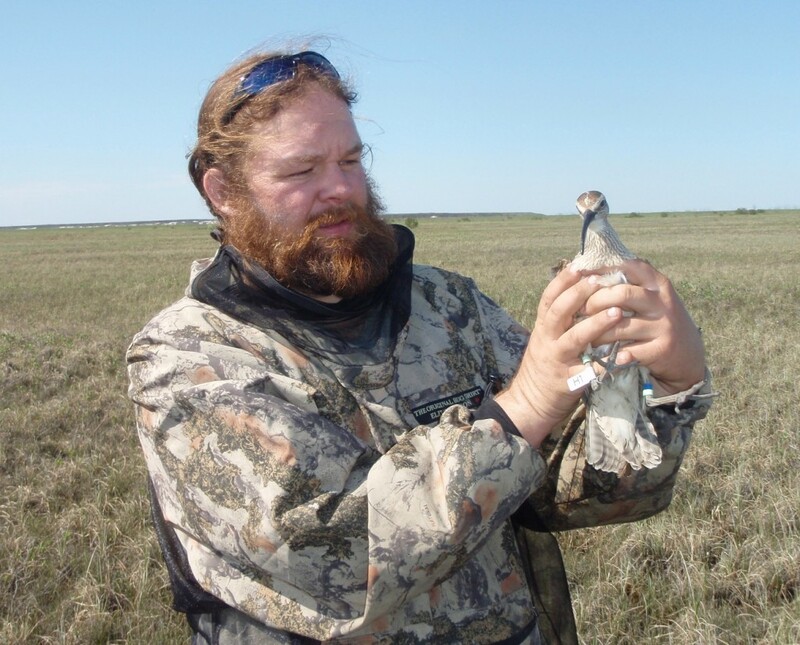 Fletcher Smith with Akpik on breeding ground in the Canadian Arctic. Photo by the Center for Conservation Biology. Updated tracking maps can be found on www.wildlifetracking.org.